Adansonia digitata L., the baobab, is a fascinating tree with a wide distribution around sub-Saharan Africa. The botanical record shows that the baobab is absent in Uganda despite the fact that it is found in nearly all of her bordering nations. Why? As botanists, it has been our aim to either find a good answer to this question or to find this tree in Uganda. Our hope was for the latter. This February, while traveling in the south of Uganda we heard reports of foresters who had seen two large specimens on the border to Kenya during a field survey east of Kidepo National Park. We wanted to believe them despite the fact that they had seen these baobabs years ago and had taken no photos or herbarium specimens. A baobab in the location they described did not seem unlikely. The Kenyan border region between Kidepo and Matheniko Game Reserve is very hot and dry. The vegetation, landscape, and soils fit with the baobab’s other areas of distribution. Moreover, these specimens would be precisely in the zone that has been noted as an empty place between Kenyan and the Sudanese baobab populations (Wickens 1982). Could Uganda not only contain the tree but also be an avenue for the historical dispersal to different areas of diversity? If these were indeed large trees, as the foresters had reported, then we could certainly make a case for that. We were also excited for an opportunity to go to far northeastern Karamoja. 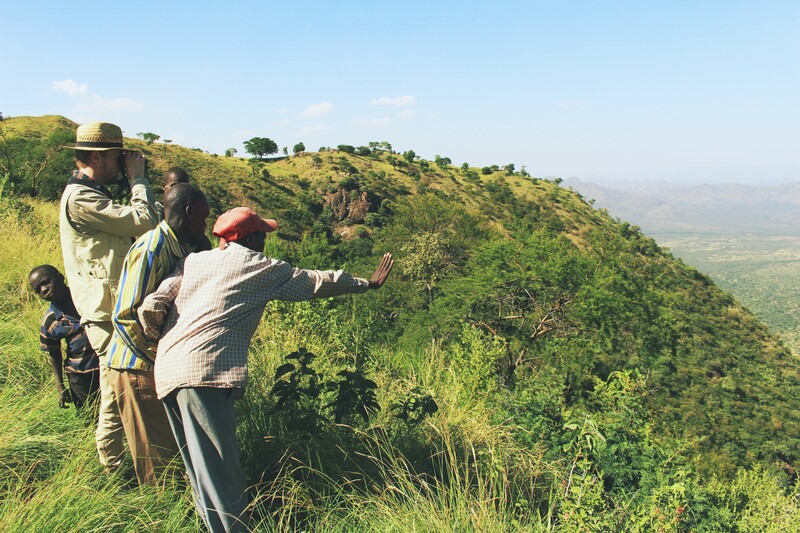 It would be a great chance to meet the Karamojong and the Ik indigenous peoples, and search with them for their elusive trees. Despite our enthusiasm, the foresters declined our invitation to search together: that should have been our first clue about what was to come. Luckily, that part of Uganda has recently become a relatively safe place to travel. The Ugandan government has just finished a successful disarmament of the northern peoples on the Uganda side. In the northeast, however, the traditional rivalries with the Kenyan Turkana just across the border have not ended, and in the evenings it is still sometimes a dangerous place to be. We followed the Kampala foresters’ remembered path to the baobab onto the traditional lands of the Ik people. Once the Ik covered the lands that are now Kidepo, but were forced out and subsequent famine and conflict has reduced their numbers such that their entire population now fits in a few small villages. Despite hardships and struggles, the Ik were warm and welcoming and very eager to explore with us. Sadly, we arrived at dusk on our first day with the Ik, still more than five hours on foot into the valley toward Orpoi Kenya before the reported location of the baobabs. The Ik chief and village leaders refused to allow us to go down to the dangerous Turkana borderlands in the evening. However, they arranged for two adventurous young men to go for an overnight hike to the trees to collect a leaf and flower or fruit for us. The next morning we arrived in the village to find the two young men with several branches, with leaves and flowers bundled in the village square, like a fresh kill. The village members were gathered around. Amid much fanfare we got through the crowd, and we knew immediately that we had been led on a wild goose chase by the foresters in Kampala. This was not a baobab, but Adenium obesum the baobab’s little caudiciform cousin. However, the story of our Ugandan baobab hunt did not end there. During this long travel, we learned of other possible locations in the dry north and followed through. Driving over 3,100 km in just a few short days, we twice circumscribed the country and found nothing in the arid north. Several times we followed convinced locals to a bombax, Ceiba pentandra (L.) Gaertn., the kapok tree. However, not all was lost. We describe in a forthcoming manuscript in Genetic Resources and Crop Evolution the luck we had in the western districts of Soroti and Iganga . Cory’s manuscript entitled “First record of a baobab (Adansonia digitata L.) in Uganda.” can be accessed here. Cory W. Whitney is a student council member of the Society for Economic Botany (SEB). He is a PhD student at the University of Kassel in Witzenhausen, Germany, and a Scientific Staff Member at the Rhine-Waal University in Kleve, Germany. Gebauer J.G.B. and C.W.W. Whitney. Tabuti JRS (2016). First record of baobab (Adansonia digitata L.) in Uganda. Genetic Resources and Crop Evolution. Wickens, G.E. (1982). The Baobab: Africa’s Upside-Down Tree. London: Royal Botanic Gardens, Kew.